Q: Which is the most suitable Babybay for me? A: Take a look at the Babybay dimensions sheet to select the most suitable Babybay to attach to your bed. Click here. Q: Does the Babybay come with a guarantee? A: Yes, it is covered by a 12 month guarantee. There are terms and conditions for the validity of the guarantee which can be read in full in our Terms and Conditions document. Q: Can I buy the Babybay outside of the UK? A: Currently we only ship within the UK Mainland for deliveries on week days. However, to request delivery costs for Saturday, the Scottish Highlands & Islands, Northern Ireland, Channel Islands, Isle of Wight & Isle of Mann – please use the Contact Us page. Q: Can I return the Babybay? A: You can cancel your order up until 7 days from the date we deliver the goods to you. It must be returned in the original packing and be undamaged and unused. You will receive a full refund. If we arrange to collect the item from you, you are liable for the charge for this service – eg: £15. Q: How long can I use the Babybay? A: The Babybay is designed to be used until your baby is approximately 6 – 7 months old, depending on how quickly your baby grows and how agile he/she is. If your baby can sit unaided then he/she has outgrown the Babybay. Q: Can my baby roll out into my bed? A: Babies start to roll at approximately 3 months but we suggest that you use the Babybay siderail when leaving your baby unattended. You can purchase your siderail from our online shop. Q: Does the Babybay attach to all types of beds? A: It attaches securely with specially designed clamps to most types of standard, framed or divan style beds – but please contact us if you have a specific query. We also sell an extension panel suitable for use on futon style or framed beds. 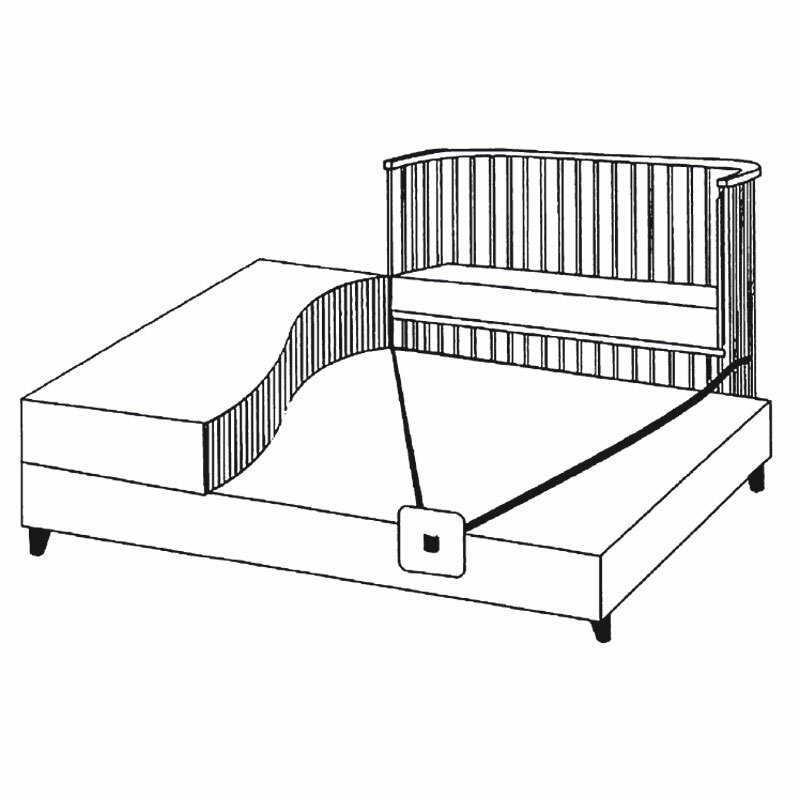 Very high divan beds would be more suited to the Babybay Maxi Boxspring (20cms taller than the Original/Convertible or Maxi Babybay) which is secured to the parent’s bed by an anchor strap between the mattresses. Q: What is the weight of the Babybay? A: The Original/Convertible cot alone weighs approx 11kg; the Maxi cot is 13.5kgs; the Trend & Maxi Boxspring each weigh c. 17.5kgs. Q: What type of mattress does the Babybay take? A: We work closely with a number of UK based manufacturers to offer you a variety of mattresses including deluxe foam or natural coconut fibre mattresses with bamboo or organic cotton covers. All are made specifically to fit the exact dimensions and shape of the Babybay. Our selection of mattresses can be viewed and purchased from our accessories page. We can only authorise mattresses branded by NSAuk – other brands have not been certified by NSAuk and we hold no responsibility for them. Q: Where is the Babybay made? A: The Babybay is designed in Germany and made in Europe from wood sourced from sustainable forests. Q: What is the Babybay made from? A: The Babybay Convertible, Maxi & Maxi Boxspring are all manufactured out of natural beech hardwood. All wood is sourced from sustainable forests in Germany and Central Europe. The Trend is manufactured out of compressed MDF board. All varnishes and paints are non-toxic, water based, tested and certified to be compliant with DIN-EN 71‑3. Q: Is Babybay lead, phthalate and formaldehyde free? A: Yes, all Babybay items sold by NSAuk are lead, phthalate and formaldehyde free. Q: Is it free from Volatile Organic Compounds (VOCs)? Q: For the engineered wood or pressed wood – do you use recycled wood waste? A: No, we do not use recycled wood waste. Q: Are any glues used in Babybay production and, if yes, are they formaldehyde free? A: Yes, glues are used in the Babybay production process and yes, they are free from formaldehyde are non-toxic, tested and certified to be compliant with DIN-EN 71‑3. Q: I’m having trouble folding the tent away, can you help? A: Yes, there is a knack to it, just watch the short video for a full run through of how best to assemble and pack away your travel centre http://www.youtube.com/watch?v=ywaIN0m2O4E . Q: How do I secure the travel centre on a windy beach? A: Tent pegs are supplied which will keep your travel centre securely in place – remember to pack them in your luggage & NOT to fly with them in hand luggage as they will be confiscated. Q: Can I buy a replacement mattress? A: Yes, they are available directly from us simply call to discuss or order here. Q: To what age can I use the travel centre? A: For our standard travel centre we recommend sleeping in the tent up to approximately 2 years but your child will happily use it for activities until they are at least 5years old. For the Deluxe version, we recommend sleeping in the tent up to c.5 years but children can still use these tents until they are 8 years old or more, both versions make great camps for indoors and outdoors fun. Q: What are the main uses for the travel centre? A: Our travel centres have multi-uses, their main purpose is as a tent with UV protection for use at the beach, in the garden or local park; the mesh sides & windows offer protection from biting insects or mosquitos; they can be used as a simple, light travel cot for home or away with family or friends or it can be used as an activity centre. Q: Where do I put the mattress to stop it sliding about? A: The air mattress zips into a specifically designed pocket in the base (not inside the tent), so doesn’t slide about. Q: How much space do I need to assemble the travel cot? Q: Can I wash the sleep mat? A: Yes, the sleep mat is fully machine washable. The Travel Centre itself and the self-inflating mattress should only be wiped clean with a damp cloth and should be fully air dried before folding / storing. Q: What Certification do the NSAuk Travel Centre have? A: The NSAuk Standard and Deluxe Travel Centres are certified as Travel Cots to BS EN 716-1:2008 +A1:2013 and can be used inside or outdoors. Modifications have been made in order for the NSAuk versions of this product to comply with all UK standards. Other branded products which appear similar are NOT certified for sale or use in the UK. The air mattress complies with EN71-3 and EN ISO 12951-1 & 2. The Cotton pad complies with OEKO-TEX® Standard 100:2012 Class 1: Baby. Q: What are the dimensions and weights of the two Travel Centre models? Q: What is the UPF of the products? A: Whilst most options are UPF certified up to 50+, the Yellow version is rated at 35UPF – we therefore use 35UPF as the standard for all colours as a guaranteed minimum. The Travel Centre does not offer complete sun protection (particularly the insect mesh), so additional & appropriate precautions against sunburn is recommended. A child’s safety is your responsibility.